We woke up this morning to find two inches of snow had fallen overnight. 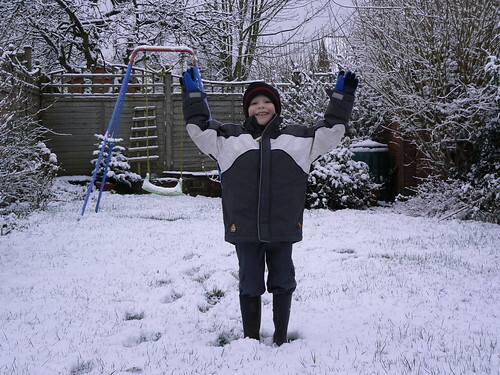 Pretty exciting for Charlie (and Daddy), as it’s the first measurable snowfall we’ve had in three years, an event which Charlie couldn’t remember. 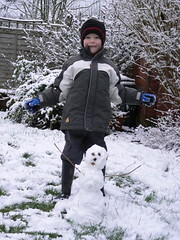 So we went out after breakfast and had a snowball fight and made a snowchild (not enough snow to make a snowman) before school. A good thing we did, too, because it was all gone by late afternoon. We’ve got fingers crossed that we’ll get more tonight. Wishing everyone a great year to come – and taking a look back at the year just ended. Author rrideyPosted on January 1, 2007 Categories Family, Observations, PhotosLeave a comment on Happy New Year!